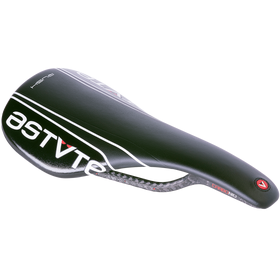 Astute developed their StarLine Miss VT Titan Ladies' Saddle with feedback from professional athletes and the result is a women's saddle that sets a new standard for ergonomics, performance and aesthetics. 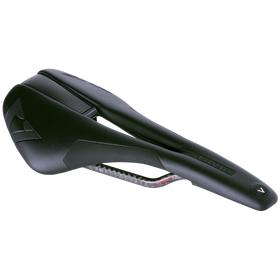 Combining an ultra-light memory foam with a carbon/nylon shell, this saddle provides maximum comfort and efficient power transfer. Memory Foam Pad (MFP): This ultra-light memory foam padding is placed into two zones with different densities. 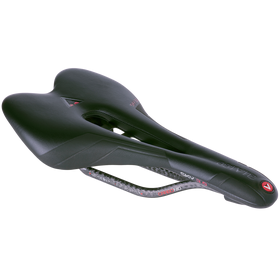 At the rear of the saddle there is increased support for the pelvic bone and the front of the saddle is made of memory foam with lower density for maximum comfort. Asymmetric Rear Design (ARD): This shape creates a new aid for riders and increases performance all while maintaining a high level of comfort. 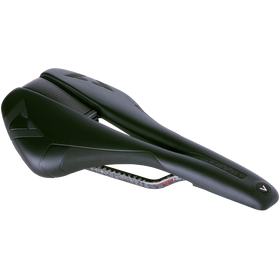 Top Design System (TDS): This outer shell concept allows connection of all the comfort advantages of an open saddle (saddle with central relief hole) with the power transfer benefits of solid saddle.